It's a cute top - I'm definitely tempted to give the pattern a try! Ooh, I probably wouldn't have rated the pattern before seeing it on you, but it's gorgeous! It looks spot on with your trousers. Really chic! This looks gorgeous, love the red on you! 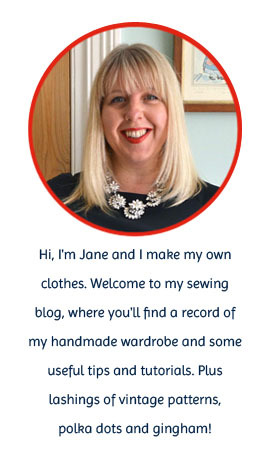 And thank you for introducing me to a new blog, I'm off to read more of Jennifer's posts now. Your version is just perfect! I love the color and the button, and the shape is so flattering. What a lovely work top and such a great neckline. I'd never heard of the patterns before and i will be following! Wow! What a cute, easy-to-sew pattern. And it is SOOOO your style! Looks fabulous! Oh, this is right in your wheelhouse! It's CUTE! It's amazing that you were able to come up with something wearable after your slip-up... last time I did that I ended up throwing away the whole works. I like the design and the way the blouse closes. 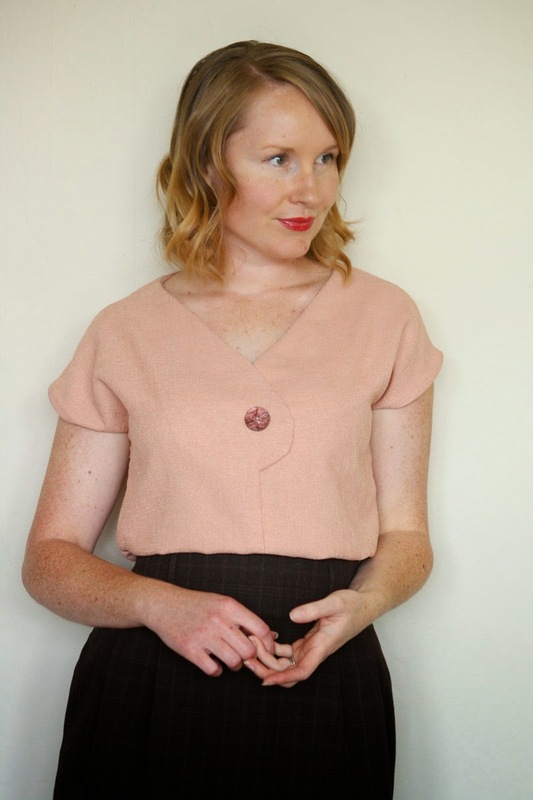 I have a friend who wants a vintage-inspired blouse so that may well give me some ideas! Thanks for the heads up Jane. I am off to get this pattern post haste! This is such a sweet pattern. Love your version! This is lovely! It looks fab with your trousers. If it's any consolation, I once was ordering boots on the interwebs while chatting to my mum on the phone, and ordered the wrong size! I realised what I'd done when I got the confirmation email, emailed back, and they veŕy kindly sent me the right size! That is a really pretty blouse, I especially love the contrast button. Really like this, Jane! Looks like a very versatile blouse, love the button placement and the colour. Off to buy my copy. That is just "so Jane"! Perfect! Gorgeous! Love the whole outfit, and you even match the picture on your wall! Such simple lines results in a super fabulous look! This is a great looking pattern and especially in the red you've chosen. Thanks for the review! This is so well timed for me it's quite unbelievable! I have scoured every pattern source I could think of for this exact blouse shape, and couldn't find it. I came to the conclusion it would have to stay in my head, me being far too lazy to try drafting it myself. But suddenly, there it is! I have some vintage rayon, which is the reason I wanted to make this sort of blouse. Now I just have to figure out how to print the pattern to scale (since I just bought it on your recommendation). I love your bright red version and it's perfect with those trousers. Wow, this is gorgeous. I love the colours of your outfit - red, navy and a white button! These are my favourites! You're right, Jane, it's definitely got a lot going for it and is a really unique design. That it's so quick to make? Bonus as there's nothing like something you can whip up in an afternoon. And I can imagine button hoarding with this top in mind! !